The media published in recent days a sensational news: that the Vatican began to square the accounts with the phenomenon called Medjugorje, and that the Pope himself called Medjugorje a fraud. In the background of this false information was the case of Fr. Tomislav Vlašic, punished by the Vatican for "spreading of doubtful doctrines, manipulation of consciences, doubtful mysticism, disobedience and fault against the sixth commandment (fornication)". As this is a priest who used to serve in Medjugorje, the authenticity of Our Lady's apparitions in Medjugorje was once again under suspicion. What says about this Dr. Fr. 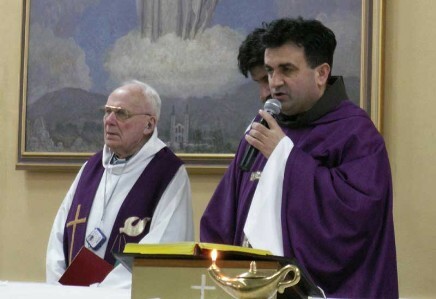 Ivan Sesar, Provincial of the Herzegovinian Franciscan Province and former Pastor of Medjugorje? I am surprised by these wrong, and I would even say malevolent, conclusions. It is well known that the Holy See is observing the events of Medjugorje with special attention, and that it has not pronounced any final judgment yet. The Vatican is not an institution that is squaring the accounts with anyone and with Medjugorje least of all. But the case of Fr. Tomislav, who was punished, is another proof for the skeptics that the phenomenon of Medjugorje has been invented by the Herzegovinian Franciscans? It is a pure fiction hat the phenomenon of Medjugorje has been invented by the Herzegovinian Franciscans. All those who are well intentioned and make an effort to find out the truth about the beginnings of the Medjugorje events, will easily find out that the Franciscans who were serving in Medjugorje at that time, approached these events with much precaution. The journalist Inoslav Bešker pushed even further and asked if precisely Vlaši? "invented the apparitions". What is the truth about the activities of Fr. Tomislav in Medjugorje? This is an equally absurd assertion. It is well known and easy to prove that Fr. Tomislav was not serving in Medjugorje in June 1981, when the first apparitions began, as the six children said. He did not even know the children. He came to Medjugorje by the will of his superiors in September 1981, after Fr. Jozo Zovko has been arrested. He was working in the parish less then 4 years, in 1985, he was transferred to Vitina, and in 1988, he left for Italy. Was Fr. Tomislav the spiritual guide of the visionaries? Was he presenting himself falsely, even to the Pope, as the one who "by God's providence leads the Medjugorje visionaries"? This provincial house has never proposed or appointed anyone as the spiritual guide of the visionaries. I think that not a single one of the parish priests of Medjugorje ever had a "mandate" to lead them spiritually. The fact is that some of the Franciscans were hearing confessions of some of the visionaries; they had, and still do have friendly relationships with them and their families. Who is whose friend or spiritual guide, you have to ask this the visionaries themselves. These days, we could read in the media that some of the visionaries denied this kind of leadership. Is the punishment that strikes Fr. Tomislav in any relation with his activities in Medjugorje? Mons. Ratko Peri?, the Bishop of Mostar, is putting it in this context. As much as I understood from the documents that I read, Fr. Tomislav Vlašic has been punished neither because of his former pastoral activities in the parish Medjugorje, nor because of the Medjugorje phenomenon, nor because of his personal attitude towards this phenomenon. When he was transferred from Medjugorje, the bishop did not take away from him any priestly faculties! I do not see the reason to connect this with his activities in Medjugorje or with the phenomenon itself, and even less reasons to interpret this as a negative attitude of the Vatican towards Medjugorje. What is the position of the Herzegovinian Franciscan Province towards the case of Fr. Tomislav Vlašic? In 1992, he officially joined the Italian Franciscan Province of Abruzzo, where he is living and working. This means that - since then - this Provincial house has no access to his occupations, and to what he is doing. According to the rules of our Order, he is not obliged to give an account about his activities to the Herzegovinian Franciscan Province of the Assumption of the BVM, and he has not done it. He is under the authority of the Provincial and the provincial Government of the province to which he belongs. I have never been officially informed about the details of his activities in Italy. The Vatican has announced a new commission that will re-examine the phenomenon of Medjugorje. What do you know about it? The rumor about a new commission that is supposed to examine the phenomenon of Medjugorje is becoming louder and louder, but our provincial office has not received any officinal written confirmation. Is this commission going to be under Pope's "patronage", has any member been appointed yet? As much as I have been informed unofficially, it is supposed to be an international commission to be appointed by the Holy See. As a provincial of the province to which the parish Medjugorje has been entrusted for pastoral care, and as a former pastor of Medjugorje, I declare that we are totally open and ready to collaborate with any commission appointed by the official Church. From the very beginning, the parish Medjugorje has been legally led by the Franciscans who, according to the rules of the Church, are appointed by the local Church authorities. The pastoral staff desires all the events to be in conformity with the rules of the Church and the doctrine of the Church. Medjugorje is not, as some think and say, "a project of some individuals or some groups", but a graceful gift of Heaven offered to today's people and humanity. Is there anything happening "behind the scene"? In Medjugorje, there is nothing secret or "behind the scene", hidden from the public eyes. Everyone, a believer or an unbeliever, can come and see what is happening and why so large crowds of pilgrims from the whole world gather there. The numbers confirm that, in spite of everything, Medjugorje is today one of the most famous places of pilgrimage in the world in the Catholic Church, and an irresistible magnet for many who seek God.